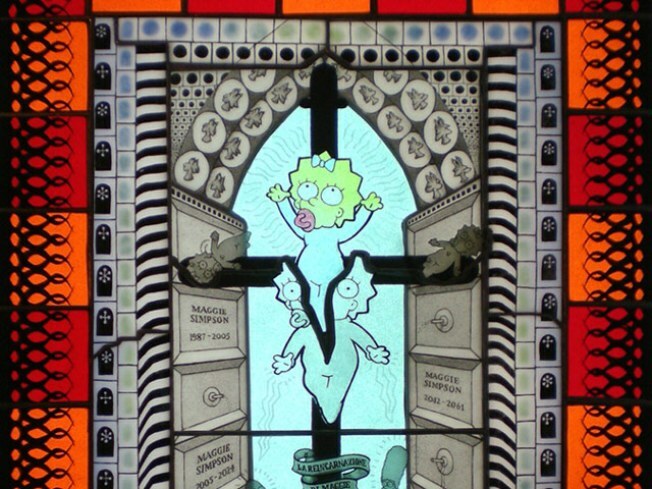 One of Joseph Cavalieri's stained glass panels, featuring morbid Simpsons scenes, which he'll discuss on Saturday. CROSSING THE LINE: Joseph Cavalieri is smashing the religious tropes surrounding stained-glass art, one at a time. He’ll discuss his inspiration for a new installation, panels depicting the Simpsons characters in scenes of death and destruction, at Think Coffee, Saturday,10AM. LIFE OF PIE: Come flaunt your pie-making acumen for a good cause: BK Farmyards, an organization seeking to turn the vast amount of unused acreage in NYC into farmable land. (Or just come and eat pie.) Cody Utzman (Papacitos/Brooklyn Standard and Food Network's Chopped), Seamus Mullen (Boqueria and The Next Iron Chef) and Diane DiMeo (Red Box Bistro and Chopped champion) will judge the entries to the 3rd Annual Brooklyn Pie Contest on Saturday. Bring pies at 5:30PM or show up at 6PM, at K&M Bar, Williamsburg. DEUX: After charming Bell House audiences at two sold-out shows this week, Charlotte Gainsbourg encores at Hiro Ballroom – just a couple of days before the January 26 release date of her new album “IRM”, featuring a the buzzy Beck duet “Heaven Can Wait.” We can’t. Saturday, Doors at 7, show at 8PM.